The location was incredible! The area was lively during the day and surprisingly quiet at night. The apartment was spacious and the beds were very comfortable. Our host was amazing and so helpful when we had questions. We loved our whole experience. Great location; right along the pedestrian route. Nice size apartment. Staff member was waiting for me w/keys and helped me move car from street location to parking lot. Ben was extremely helpful. Very nice restaurant literally five steps from apartment gate. The Wohnzimmer apartment was in a great location. The space was roomy, clean and well appointed. We visited in July and the air conditioners were great, the bathroom was clean with a skylight. In fact there was great natural lighting through out. The master-bedroom had a very comfortable bed and was well furnished. The apartment was quiet even though it was close to restaurants, shops and bars. We traveled with a 17 and 18 year old that stayed in the main living room and there we no issues with space. Would highly recommend . The hostess was very responsive and replied quickly to questions. The apartment was nicely stocked with coffee an basics like oil and vinegar. The room is really nice, very well located in the city center with access to a cellar full of beers and wine (even if we didn't have time to use it) and not far away from the private parking. Roswitha and her friend Alex were really helpful in helping us organizing our arrival. The free ticket for the cable car was also very much appreciated ! The place is located in the heart of historic city. You can see all, just in a few minutes on foot. We loved this apartment, it has a really special feel to it. We enjoyed buying the local produce and cooking in the apartment. It has everything you need to make you feel at home and the beds were super comfortable! The room exceeded our expectations. It was super clean and nice. The beds were super comfortable. The host met us upon arrival and we were able to check-in with no problems at all. The apt was centrally located and the two beds were comfortable. There was a good coffee machine and a flat screen tv. We are also provided us with a card that allowed us to visit museums in the city for free and take public transport without charge. Wow!! Lock in a great price for Wohnzimmer – rated 9.6 by recent guests! Featuring air conditioning, Wohnzimmer offers accommodations in Bolzano. Bolzano Christmas Market is 650 feet away. Free WiFi is featured throughout the property. All units have a satellite flat-screen TV. There is a seating and/or dining area in some units. There is also a kitchenette, fitted with a dishwasher and refrigerator. A stovetop and coffee machine are also offered. Towels and bed linen are available. Funivia Colle is 0.9 mi from Wohnzimmer, while Funivia S. Genesio - Seilbahn Jenesien is 1 mi from the property. This is our guests' favorite part of Bolzano, according to independent reviews. 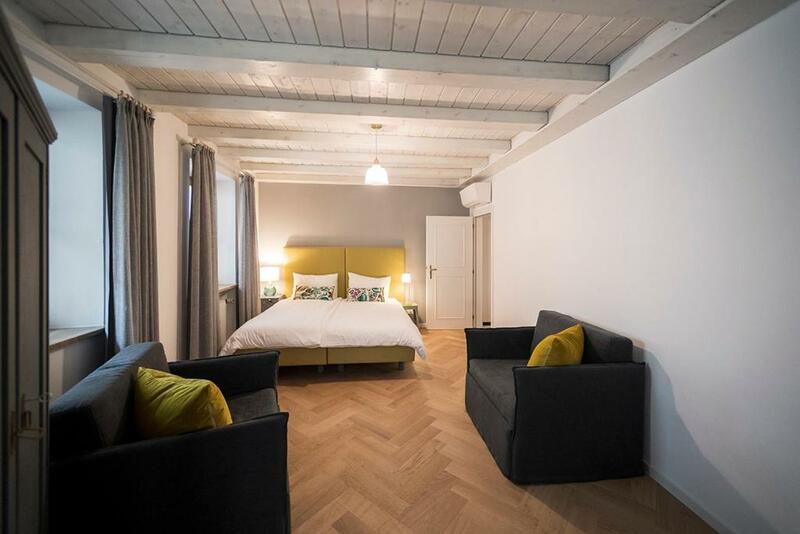 This property also has one of the top-rated locations in Bolzano! Guests are happier about it compared to other properties in the area. 뀐 Located in the top-rated area in Bolzano, this property has an excellent location score of 9.8! When would you like to stay at Wohnzimmer? Wohnzimmer is ... FEEL-GOOD SPACE Four walls and a bed, that’s all you need for a vacation in a city. Wohnzimmer however offers more than visible conveniences such as bed, chair, table, couch and kitchen. It also emits a feeling of lightness and warm ambience. Our charming lady of the house Roswitha selected each piece of furniture and accessory, every tile individually herself. This devotion is visibly felt throughout the house. 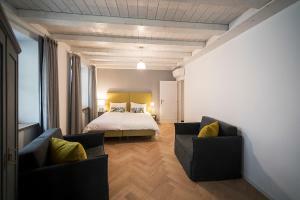 Wohnzimmer is ... A LOCATION THAT WOWS YOU In midst of Bozen’s historic district, in the heart of South Tyrol’s thriving capital Wohnzimmer is perfectly situated for starting trips and adventures of all sorts. Facing the closed courtyard, all apartments offer enough peace and relaxation from the bustle of city life. Wohnzimmer is... PRAGMATICALLY CHARMING Who said charming cannot be practical? 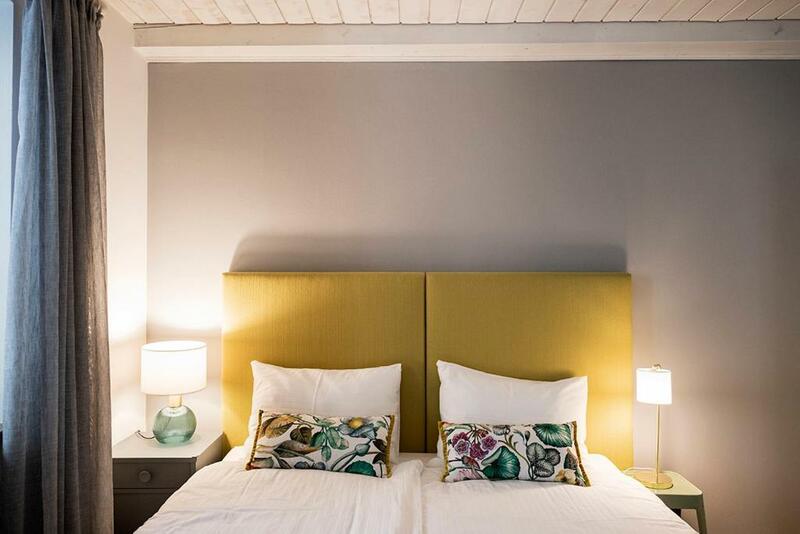 Free Wi-Fi in all rooms, dish washer in every kitchen, the BozenCard for free entry and access to public transport and museums - these are the covenient ingredients we add for your perfect stay in Bozen! Wohnzimmer is ... German for LIVING ROOM And it lives up to its name. Is there any better place for reading your favorite author, relaxing over a cup of tea. Hello, I'm Roswitha. What is the best way to introduce myself? I am always a bit hectic, mostly in a good mood and tend to talk too much. I love my job and am happy to meet people from all over the world. 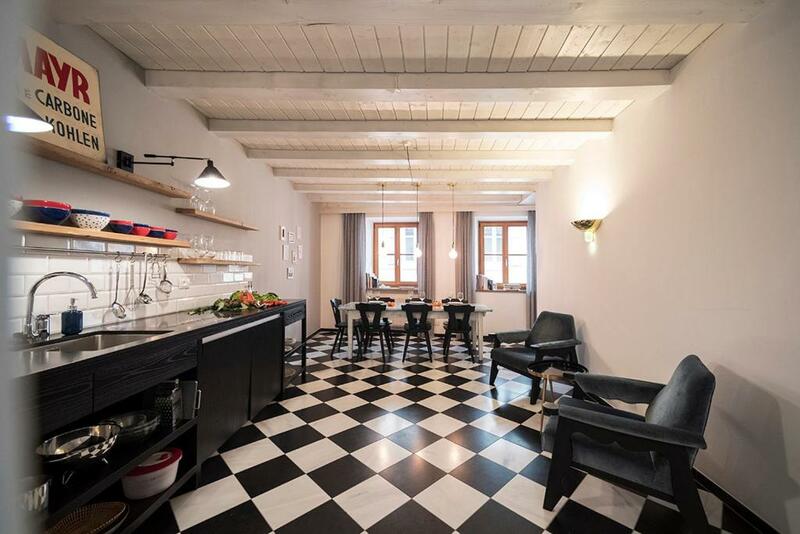 Located in the heart of Bozen’s historic district, Wohnzimmer is surrounded by countless sites and activities you can embark on without moving too far from your vacation retreat. Ancient buildings, churches, museums and of course numerous shopping opportunities as well as cafés and restaurants all side by side and all in easy walking distance. Drop by the Museum of Archeology and check out the famous man from the ice, Ötzi, or go on a hiking trip on one of the surrounding mountains. It doesn’t matter what your destination – Wohnzimmer is right at the heart of countless possibilities which make your holidays unforgettable. The architecture in Bolzano’s old town is a pleasant blend of pastel-colored buildings, murals and elaborately finished arcades. Cobblestone streets are perfect for some al fresco dining and drinking. House Rules Wohnzimmer takes special requests – add in the next step! Wohnzimmer accepts these cards and reserves the right to temporarily hold an amount prior to arrival. If you arrive with children under 2 years of age, please inform the property in advance. Please inform Wohnzimmer of your expected arrival time in advance. You can use the Special Requests box when booking, or contact the property directly using the contact details in your confirmation. The walls are not thick at all, and one night we could hear the neighbors party until 2 a.m. However, no noise from the street, which is cool. The unit had the layout of a mobile home- long and narrow with a window at one end that looked into another window several feet away From looking out the window we had no idea of what the weather outside was like. The décor was very basic. The furniture was unattractive . There were two uncomfortable chairs other than the ones around the dining table. The lamp attached to one of the chairs looked like one of those old-fashioned hair dryers used in hair salons. The floor of the apt seemed to be of poorly painted ciment. We had the impression of being in an inexpensive motel unit off some unbeaten highway in North America-somewhere to spend a night if you were low on cash or there were no other accommodations in the area. However, I had paid almost 110 Euros (165 Canadian) a night for this place!! It was not worth the price charged by a long shot. We were on the lower floor so there was noise on a couple of occasions from the apartment upstairs. Next time we would ask for an upper floor apartment. Jakob met us at the apartment. This was the first place we have stayed where a host has been there to greet us and assist with luggage. We were very impressed by this young man's attitude and personality. We felt welcomed and he gave us lots of tips and answered our questions regarding places to go etc. Most importantly, our hosts gave us the Musemobil Card which gave us free use of all public transport and entry to museums in the South Tyrol region. We stayed in Bolzano for seven nights so this card was a godsend and we are truly grateful to our hosts for giving it to us. The bed and pillows were great, the kitchen had everything we needed and the bathroom was clean and modern. We will return! Stunning apartment made comfortable with everything required at hand. Fabulous location. Excellent location, Great service. The apartment looks very nice and clean. It's a home away from home. It has everything you need and want. It's 10/10 and certainly the best experience I've had in my years of travel around the world. The family is absolutely lovely and so is the place. If I was to return to Bolzano theres no doubt I would be staying there again. 10/10 do yourselfa favour and stay there, you will not regret it. Friday night noice from the city centre but if you close the windows and switch on the air-conditioning you are just fine. Alternatively, go and join the crowd. One of those great places you will remember for life to have visited and stayed in. We liked and enjoyed the extras (wine, pasta, beer), made available. Great to combine city and hiking holiday. It was a pleasure to communicate and meet with the owner. Many thanks. Roswitha has created a great place to stay and is a perfect host. We hope to come again.